Have you tried the The Pimsleur Method to learning a new language? What did you think? Was it a good program? I know this blog is about books and reading, but publishers also provide us with many learning tools in addition to the books we love, like Simon & Schuster’s Pimsleur Method for learning new languages. Just look around your favorite bookstore and you’ll see so many great resources! I’ve been trying to learn Spanish to better communicate with my husband’s extended family in Peru. I’d like to be able to have a phone conversation beyond just saying hello and how everybody is doing today, so I’ve been trying to find easy, cost-effective ways to learn. To help me learn easy words and phrases, I’ve been listening to Spanish music and following along with lyrics that I found on musica.com and then translated using Google Translate. I think the repetition makes it easier to recognize words. Plus, I’ve discovered I love Spanish music! My playlist grows every week and I’ve been enjoying listening to Enrique Iglesias, Reik, Camilia, Mana, Luis Fonsi, Chayanne and many more. Who are your favorites? 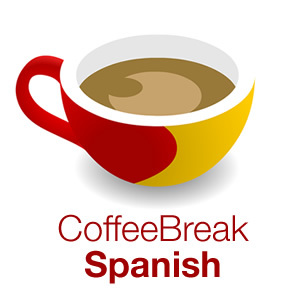 During my commute, I’ve been listening to Coffee Break Spanish which is an excellent program presented in short 15-20 minute segments. The early lessons are a great way to brush up on my vocabulary and later lessons are teaching me new material and the proper way to speak the language. In the evenings, I’m doing vocabulary drills with the Mindsnacks Spanish app on my iPhone which uses several different word games to help with recall and spelling and is a lot of fun. 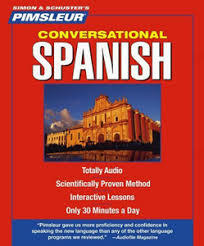 I’m beginning to pick up on individual words and phrases when I hear them in conversation and can respond in Spanish to simple questions. So, I feel like I’m making some progress (slowly! ), but in the next few months, I know I’ll need to break down and buy a series like The Pimsleur Method (the mp3s) to help me in what I know is a much better, more efficient method than my self-created curriculum. Once I do get the system, I’ll post updates to let you know how it’s going. Did you use a system like that or take classes at a language learning center? I’m interested in hearing what methods you’ve tried when learning a new language and what you found to be the most helpful. Please share your experience in the comments!